With a choice of AR2443 and AR2445 designs, you have double the choice for double the fun! Each watch has a durable, stainless-steel bezel and scratch-resistant mineral glass, as well as minimalist and classy dials unmarked by numbers but with the classic Armani branding. Be on time and on style with a ladies Armani watch! Choose between AR2443 and AR2445 designs. With either a gold or silver stainless-steel bezel. 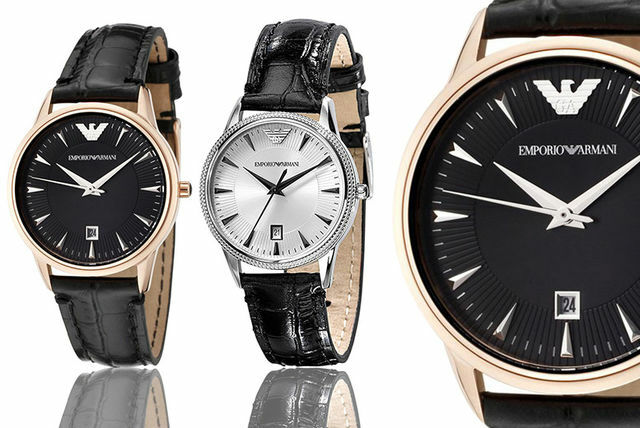 Sleek silver or black, Armani-branded dials. And durable, scratch-resistant, mineral crystal glass on the dial.